With this product, you earn 19 Reward point(s). 19 points = $0.19. Goji berries grow on an evergreen shrub found in temperate and subtropical regions in China, Mongolia and in the Tibetan Himalayas. They are in the nightshade (Solonaceae) family. Goji berries are usually sold dried. They are shriveled red berries that look like red raisins. Goji berry juice has been marketed as an antioxidant-rich juice, along with acai berry, noni juice, mangosteen, camu camu, maqui and tart cherries. Although goji berries have a long history of use in traditional Chinese medicine, there is currently a lack of evidence on the potential health benefits of goji berries. Goji berries are rich in antioxidants, particularly carotenoids such as beta-carotene and zeaxanthin. One of zeaxanthin's key roles is to protect the retina of the eye by absorbing blue light and acting as an antioxidant. In fact, increased intake of foods containing zeathanthin may decrease the risk of developing age-related macular degeneration (AMD), the leading cause of vision loss and blindness in people over the age of 65. MORE: Supplements for age-related macular degeneration. In recent years, goji juice has become popular as a health beverage. Companies marketing goji juice often mention the folktale of a man named Li Qing Yuen who consumed goji berries daily and lived to be 252 years old. Although the goji berries used in traditional Chinese medicine are not very expensive, goji juice is often very pricey. Considering that a 32-ounce bottle of goji juice (about an 18-day supply) can run as high as $50 USD, the evidence isn't compelling enough at this time to justify the cost of goji juice. Also, we don't know the side effects of regular goji consumption, or whether it will interfere with treatments or medications. There have been several test tube studies that show that goji berry contains antioxidants and that goji extracts may prevent the growth of cancer cells, reduce blood glucose, and lower cholesterol levels. However, that doesn't necessary mean that goji will have the same benefits in humans when taken as a juice or tea. Goji berries have a mild tangy taste that is slightly sweet and sour. The whole, dried berries have a similar shape and chewy texture as raisins. 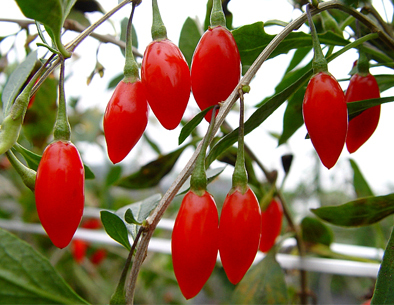 Other names for goji berries are Lycium barbarum, wolfberry, gou qi zi, and Fructus lycii. In traditional Chinese medicine, goji berries are eaten raw, brewed into tea, added to Chinese soups, or made into liquid extracts. Goji berry juice and tea are available. The berries or juice can be used in smoothies. Whole goji berries are also an ingredient in packaged snack foods such as goji berry trail mix. Goji berries may interact with anticoagulant drugs (commonly called "blood-thinners"), such as warfarin (Coumadin). There was one case report published in the journal Annals of Pharmacotherapy of a 61-year old woman who had an increased risk of bleeding, indicated by an elevated international normalized ratio (INR). She had been drinking 3-4 cups daily of goji berry tea. Her blood work returned to normal after discontinuing the goji berry tea. Cheng CY et al. "Fasting plasma zeaxanthin response to Fructus barbarum L. (wolfberry; Kei Tze) in a food-based human supplementation trial." British Journal of Nutrition. 93.1 (2005):123-30. Lam AY et al. "Possible interaction between warfarin and Lycium barbarum L." Annals of Pharmacotherapy. 35.10 (2001):1199-201. Wu H et al. "Effect of Lycium barbarum polysaccharide on the improvement of antioxidant ability and DNA damage in NIDDM rats." Yakugaku Zasshi. 126.5 (2006):365-71.